Thank you for joining us for week two of our Crimson & Clover Train Cases Sew Along with the lovely Sara Lawson of Sew Sweetness! Zippers are a stumbling block for many sewists, but they don’t have to be. Today we’re discussing all things zippers, with some great zipper tips and tutorials from your host, Sara Lawson. Zippers 4 Ways – I wrote this post a few years ago after speaking on the same topic at Sewing Summit. In the post, I discuss how to insert a top zipper (like in a zippered pouch), how to insert a zipper into a panel of a bag, two different ways to install a zippered pocket, and how to sew an invisible zipper. How to Add a Zippered Mesh Pocket – This article was written on specifically how to install a mesh zippered pocket to the lid of my Ansel Camera Bag sewing pattern, however, this same method can be used for a panel in a bag or a bag flap – like the big interior zipper pocket in the Crimson and Closer Train Cases. It’s great for keeping things secure while also visible. How to Make a Zippered Pouch – Back in 2011, when my blog was less than a year old, my friend Bree from My Crafty Crap wrote a *very* comprehensive tutorial on how to make a zippered pouch as part of my Sewing Back-to-School series. This is a great read if you’d like to make your zipper corners pretty and flat! How to Make a Recessed Zipper – If you were ever curious how I make a recessed zipper, I invite you to check out my free pattern for the Baker Street Bag. If you’d like to use this method for a larger bag, you can modify the zipper panels and length of the zipper and install it in just about any bag. How to Insert a Zippered Pocket – I wrote this tutorial for the Craftsy blog on how to insert a zippered pocket into any bag. Here, I have the back of my Lilium Laptop Bag, in which I’ve inserted that white zippered pocket. And here’s a tip, as promised! When I am teaching, I struggle with how to best instruct a student who may not have inserted a zipper before, because what I would do is not necessarily something I would suggest to a newbie (do as I say, not as I do!). I usually insert a zipper with no pins, because pins can make a zipper very wavy. Stitch Witchery or a glue stick are great to temporarily hold a zipper in place, and even one or two pins will invite some waviness in. A quick an easy solution? 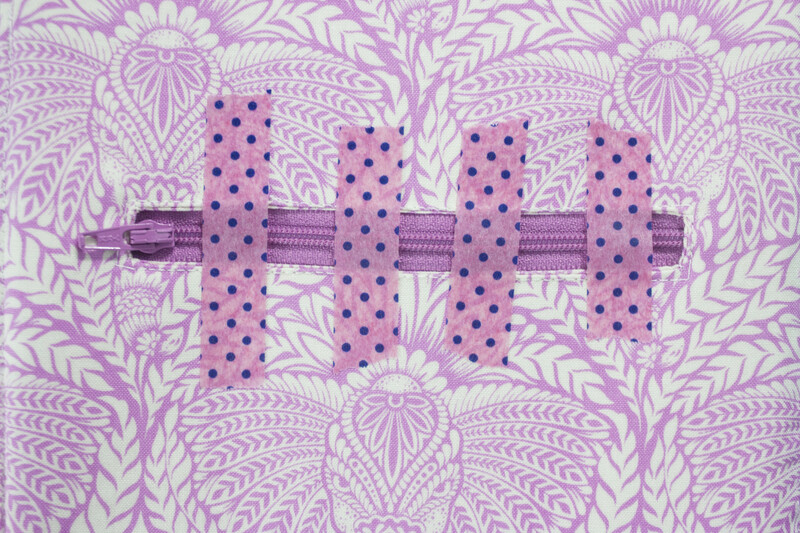 You can use washi tape or scotch tape to vertically tape your zipper in place before you begin to sew. As you approach each bit of tape, peel back the tape, sew past it, retape, then continue on. The tape will not leave any residue on your fabric either, so it’s a simple solution to the zipper wigglies. Join us next week for tips on finishing up these too-cute cases! There is still time to join – grab the pattern here to get started! Read the interview with Sara Lawson here.